Do You Have Family Memories You Would Like To Preserve? 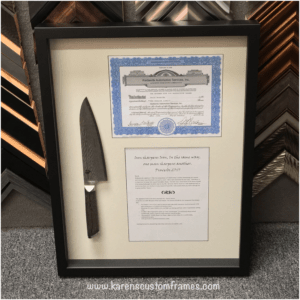 Do you have a Custom Framing project? These two custom designed display boxes with “special family memories” were created for Father’s Day gifts for our customer. What wonderful memories this family will have for a lifetime! 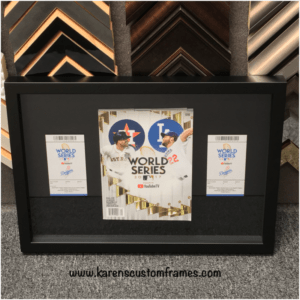 At Karen’s Detail Custom Frames we help our customers create stylish, timeless designs for all their custom framing projects, while keeping their budget in mind. Karen would be happy to help you preserve your certificates, family memories, keepsakes and heirlooms, along with your photos, prints, posters, giclees, canvas art and sports memorabilia with a unique custom designed picture frame or shadowbox display that would be cherished and enjoyed.